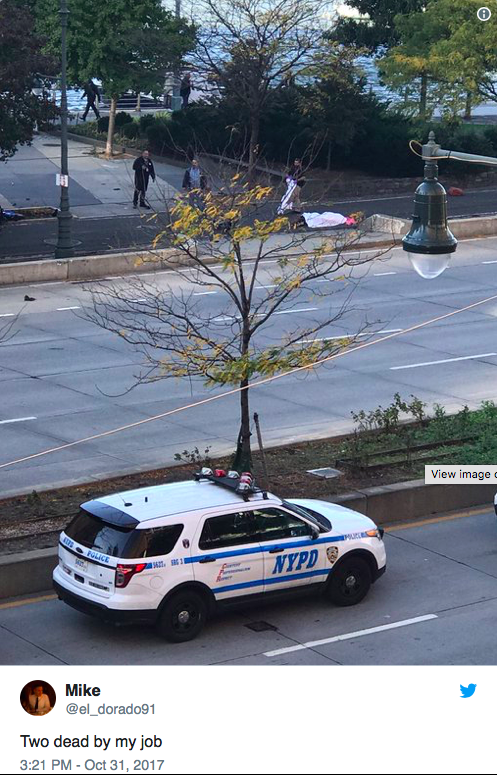 At approximately 3PM EST today, a man drove into the bike path lane adjacent to the West Side Highway in NYC for several blocks, striking several bike riders and pedestrians. Afterwards, gunfire was heard on the streets. Officers have responded and they do have a man in custody, but it looks like there are 6 people dead and at least 11 injured. Police haven't listed the names of the suspect or the deceased, but we are monitoring their media activity. Traffic has be diverted around the area and the streets are full of police responders. UPDATE: According to the NYPD twitter, the suspect was brandishing an imitation firearm and was shot by police. On CNN.com, witness Ramon Cruz shares; "What I saw was that the driver -- he didn't look like he was bleeding. He was dragging his foot. He looks frustrated, panicked, confused. People are running past me, saying, 'He's got a gun. He's got a gun." I didn't see any gun. It was a white pickup truck. He looked pretty bad without bleeding or anything like that. I didn't see him hit anybody. All I heard was the impact of a crash."